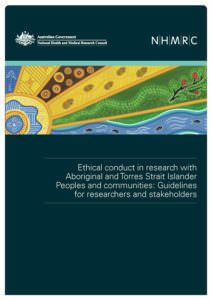 In general, ethics guidelines provide a set of principles to ensure research is safe, respectful, responsible, high quality, of benefit to Aboriginal and Torres Strait Islander people and communities and of benefit to research. Ethical conduct in research with Aboriginal and Torres Strait Islander Peoples and communities: Guidelines for researchers and stakeholders 2018 (the Guidelines) defines six core values — spirit and integrity, cultural continuity, equity, reciprocity, respect, and responsibility. Applying these values and other ethical principles will ensure that research conducted with or for Aboriginal and Torres Strait Islander people and communities, or their data or biological samples, is ethically conducted. The Guidelines are intended for use by researchers and ethics review bodies, such as Human Research Ethics Committees (HRECs). Aboriginal and Torres Strait Islander Peoples, individual research participants, participant groups, the wider community and other stakeholders may also find the Guidelines useful. Advice about how to use the Guidelines is provided on page 13. This includes information about Keeping research on track II 2018, which describes how the values and principles in the Guidelines can be put into practice. Additional principles and concepts relevant to research with Aboriginal and Torres Strait Islander Peoples and communities are set out on pages 15 to 19. Key terms, a glossary and a list of further resources are also provided. More information about the Guidelines is available on NHMRC’s website.